X It swims at a steady 5 knots. If it senses danger, it will strike back with its sharp horn. X Il nage à 5 nœuds. Quand on l’agresse, il réplique d’un bon coup de corne aiguisée. X Nada a una velocidad de cinco nudos. Si siente peligro, golpea con su afilado cuerno. X Nuota alla velocità di 5 nodi. Se avverte il pericolo, contrattacca con il suo corno aguzzo. X 5노트의 스피드로 헤엄친다. 몸에 위험을 느끼면 날카로운 뿔로 반격한다. Y Its dorsal, pectoral, and tail fins wave elegantly in water. That is why it is known as the water dancer. Y Ses nageoires dorsales et pectorales bougent avec élégance. Il est surnommé le danseur des flots. Y Sus aletas dorsal, trasera y pectoral ondean gráciles en el agua. Por eso es llamado el Bailarín Acuático. Y Le pinne su dorso, petto e coda ondulano con grazia in acqua. Per questo lo chiamano “danzatore d’acqua”. Y 등, 가슴, 꼬리지느러미가 우아하게 나부끼기 때문에 물의 무희라고 불린다. Omega Ruby Goldeen loves swimming wild and free in rivers and ponds. If one of these Pokémon is placed in an aquarium, it will shatter even the thickest glass with one ram of its horn and make its escape. Omega Ruby Goldini liebt es, in Teichen und Flüssen zu schwimmen. Wenn ein solches Pokémon in ein Aquarium gebracht wird, wird es selbst das dickste Glas mit einem Stoß seines Horns zum Zerbersten bringen und die Flucht ergreifen. Omega Ruby Poissirène adore nager librement dans les rivières et les étangs. Si l’un de ces Pokémon est mis dans un aquarium, il n’hésitera pas à casser la vitre avec sa puissante corne pour s’enfuir. Omega Ruby A Goldeen le encanta nadar libremente y a su aire en ríos y estanques. Si pones a uno de estos Pokémon en un acuario, usará el cuerno que tiene para romper las paredes, independientemente del grosor del cristal, y escapar. Omega Ruby Goldeen ama nuotare libero in fiumi e laghetti. Se messo in acquario, questo Pokémon riesce a fuggire spaccando anche il vetro più spesso con un colpo secco del suo corno. Omega Ruby 강이나 연못을 헤엄치는 것을 매우 좋아해서 수조 같은 곳에 넣어 두면 두꺼운 유리도 뿔의 일격으로 깨고 도망간다. Alpha Sapphire Goldeen is a very beautiful Pokémon with fins that billow elegantly in water. However, don’t let your guard down around this Pokémon—it could ram you powerfully with its horn. Alpha Sapphire Goldini ist ein wunderschönes Pokémon, dessen Flossen sich elegant im Wasser wiegen. Aber man muss auf dieses Pokémon achtgeben. Es könnte einen sonst heftig mit seinem Horn rammen. Alpha Sapphire Poissirène est un Pokémon magnifique doté de nageoires qui ondulent élégamment dans les profondeurs. Il ne faut pourtant pas baisser sa garde face à ce Pokémon, car il peut charger avec sa puissante corne. Alpha Sapphire Goldeen es un bello Pokémon que mueve con elegancia las aletas en el agua. Con todo, no hay que bajar la guardia, en cualquier momento puede embestir con el cuerno. Alpha Sapphire Goldeen è un Pokémon molto elegante dai movimenti aggraziati. Tuttavia, è necessario stare attenti poiché potrebbe attaccare violentemente con il suo corno. Alpha Sapphire 물속에서 우아하게 나부끼는 지느러미가 매우 아름다운 포켓몬이지만 방심하고 있으면 강렬한 뿔의 일격을 당한다. Sun When the weather grows warm, they form groups and swim upriver. This sight serves as a poetic reminder that spring has arrived. 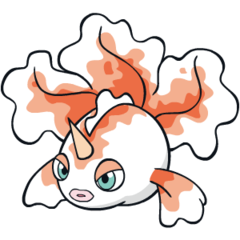 Moon Spellbound by the length of its horn and the beauty of its fins, many strange Trainers raise Goldeen and nothing but Goldeen. Red Its tail fin billows like an elegant ballroom dress, giving it the nickname of the Water Queen. Blue Its tail fin billows like an elegant ballroom dress, giving it the nickname of the Water Queen. Yellow When it is time for them to lay eggs, it can be seen swimming up rivers and falls in large groups. Stadium Its beautiful tail fin billows and flutters like an elegant dress. Swims at a speed of five knots. Gold Its dorsal, pectoral and tail fins wave elegantly in water. That is why it is known as the water dancer. Silver A strong swimmer, it is capable of swimming nonstop up fast streams at a steady speed of five knots. Stadium2 Its dorsal, pectoral and tail fins wave elegantly in water. That is why it is known as the water dancer. Ruby Goldeen is a very beautiful Pokemon with fins that billow elegantly in water. However, don't let your guard down around this Pokemon - it could ram you powerfully with its horn. Sapphire GOLDEEN loves swimming wild and free in rivers and ponds. If one of these POKeMON is placed in an aquarium, it will shatter even the thickest glass with one ram of its horn and make its escape. LeafGreen Its tail fin billows like an elegant ballroom dress, giving it the nickname of "The Water Queen." Emerald In the springtime, schools of GOLDEEN can be seen swimming up falls and rivers. It metes out staggering damage with its single horn. Pearl It swims at a steady 5 knots. If it senses danger, it will strike back with its sharp horn. Platinum Though it appears very elegant when swimming with fins unfurled, it can jab powerfully with its horn. Black Though it appears very elegant when swimming with fins unfurled, it can jab powerfully with its horn. White Though it appears very elegant when swimming with fins unfurled, it can jab powerfully with its horn. White 2 Though it appears very elegant when swimming with fins unfurled, it can jab powerfully with its horn.